We invite you to listen to your heart and choose these unique heart design topiary place card holder favours. 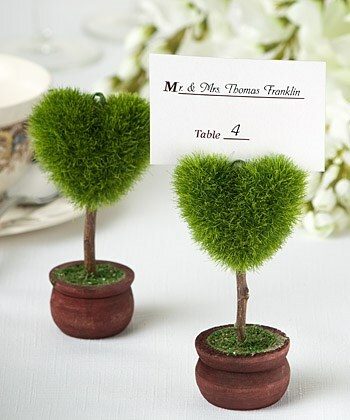 It's easy to turn your event space into a lush topiary garden filled with love when you have these stylish heart design topiary place card holders/favours on your tables. And these lovely favours also double as photo/note holders when your guests take them home. Each heart topiary favour measures 4" x 2" and has a sculpted green grass-like heart shaped topiary top "growing" out of a dark stained wood pot. Discreetly tucked at the top is a green wire holder for place card or photo. Each topiary favour comes in a poly bag. Item does not come with a place card.